I was looking at pictures for The Second Achilles‘ Pinterest page this morning, and came across this one of Hephaestion. This head of Hephaistion, broken from a full-length statue, was originally part of a multi-figured group, which might have depicted a sacrificial scene. The J. Paul Getty Museum has more than thirty fragments of this group. The participants include Alexander, Hephaistion, a goddess, Herakles, a flute player, and several other figures, as well as animals and birds. This group may have served as a funerary monument for some nobleman who wanted to associate himself with Alexander, or it might be a monument erected in response to Alexander’s call for the creation of a hero cult. I have to admit, I’ve seen the bust before and not given it too much consideration. This time, however, my attention was immediately drawn to the date of its carving; according to J Paul Getty, the statue was carved c. 320 B.C. If that is correct (and I am not in a position to say otherwise) the statue was carved as few as four years after Hephaestion’s death and, of course, three after Alexander’s. For me, the statue’s production after Hephaestion’s death is very significant as it provides proof that Hephaestion was remembered after his death, which is not an impression I get from the books I have read about Alexander’s life and times. Of course, that may be because I have not read enough or, understandably, because the writer’s focus has been elsewhere. 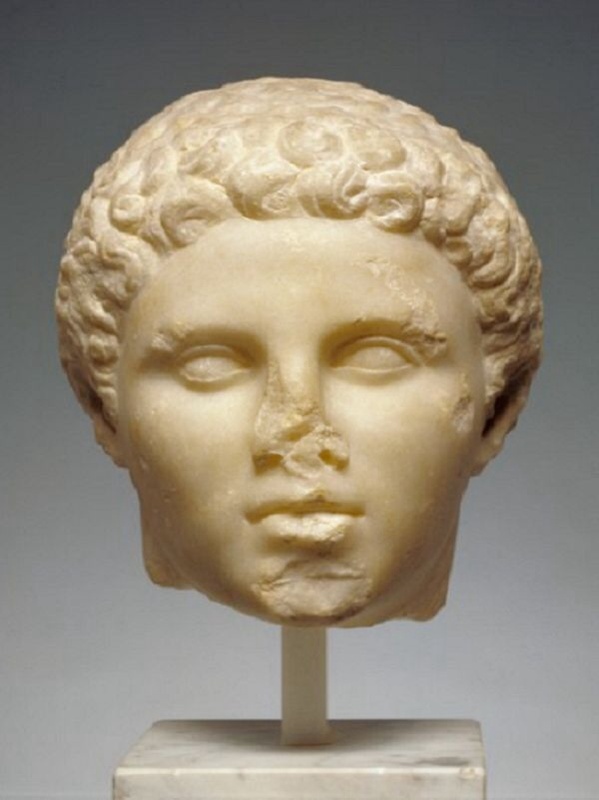 Happily, though, someone, somewhere (according to the text accompanying the head of Alexander [below] the group was found in Megara, Greece) thought either that Hephaestion’s presence was necessary to a correct remembrance of Alexander or that he – Hephaestion – was worth remembering in his own right (as Alexander wanted): as a hero. This knowledge makes feel as if I have – even if just for a moment – gone below history: past the partisan writings of people like Ptolemy and Aristobulos and their successors, Arrian and Plutarch, which are prone to blank out events and forget people not relevant to their agenda, and into someone’s actual life; out of the library and right up to someone’s doorstep. Alas, for the want of knowledge which means I can go no further! Sadly for me, I am probably romanticising the truth. 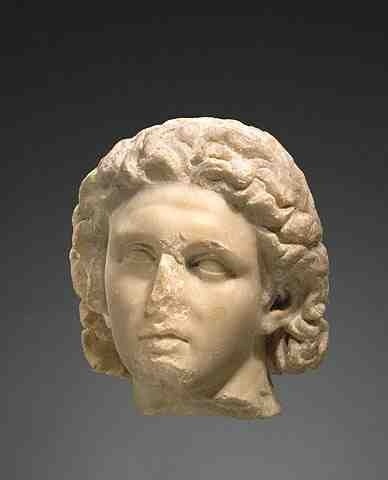 According to J Paul Getty, the head of Alexander is an idealised image. If that is the case, I expect the head of Hephaestion is as well. In fact, I would be most surprised if it was not. It is as partisan an image, therefore, as Ptolemy et al are writers. But maybe I shouldn’t worry too much. The head, after all, is still proof of Hephaestion’s continuing importance after his death and that is something that – up until this morning – I did not have a great sense of. I may not have gone below history but I have taken a further step into it, which is no less thrilling. I think Hephaestion is one of the most underrated men in history, so this is good to see. It’s unfortunate that those who wrote what history we have more or less whitewashed him out. Thank you for sharing this. Just a warning. Olga Palagia (et al.) believes these to be a forgery. I’m not an art historian, but there is plenty of speculation among those who are to cast doubt on these as authentic. Forgery is big business, and the Getty has a particularly shady history at acquisitions. Also, unfortunately, it IS very idealized, in the Classical Greek style, and no name accompanies it. While Alexander is recognizable, we’re really not sure who this figure is. It could be a person, a god, or a random person. Sorry to dump ice on the speculation, but I wouldn’t put too much stock in these images. Thank you for the warning. It is always good to be reminded that all is not what it seems.